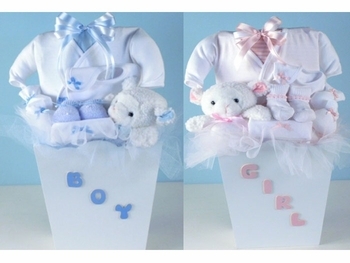 This is the perfect gift for twins who have arrived a little early or with a lower than normal birth weight! Available in blue or pink in any combination for boys and girls with the option to add additional sets for triplets and more. These all cotton ensembles are designed and sized specifically for preemies. All the clothing items feature non-irritating seams, monitor access and 100% combed cotton material, all made in the USA of the softest and finest cotton fabrics. Completely gift wrapped, this gift set will be appreciated by the new parents and their babies!